Event Coverage by Elain Genser, Sharon Musto, and Bruce Lambert. Attendance may have been slightly down this year but ‘spirit’ was certainly high during this year’s Washington State International Kite Festival (WSIKF). Featured fliers were Frank Schwiemann and friend Chrstine from Germany; Tony Rice from Australia, and Stretch Tucker was the AKA sponsored guest. The festival was also pleased to welcome Rob Brasington of Tasmania. Frank Schwiemann and Christine filled the sky and ground with colour and movement. Frank tethered a set of six giant Bols, and covered the ground with clusters of baby banners as well as the standard twenty footers. A number of ethereal white deltas trailing ‘skirts’ of untreated ripstop hovered gracefully for days, almost ghost-like — a crowd favourite which garnered them the People’s Choice Award. They carried simple, graphic black tipped white tube line laundry. Tony Rice brought his awesome painted sails – one an extremely long tyvek and bamboo dragon, and another an exquisitely painted angel. Tony says he ‘married’ into bamboo. His wife’s family owns a piece of land in Queensland where black bamboo grows profusely, leading to Tony’s almost exclusive use of bamboo in his kites. He also brought numerous iridescent small fighter-like bug kites with him from Australia. Stretch ‘Parafoil’ Tucker was the AKA’s featured guest. This was Stretch’s first visit to this ‘left coast’ event. 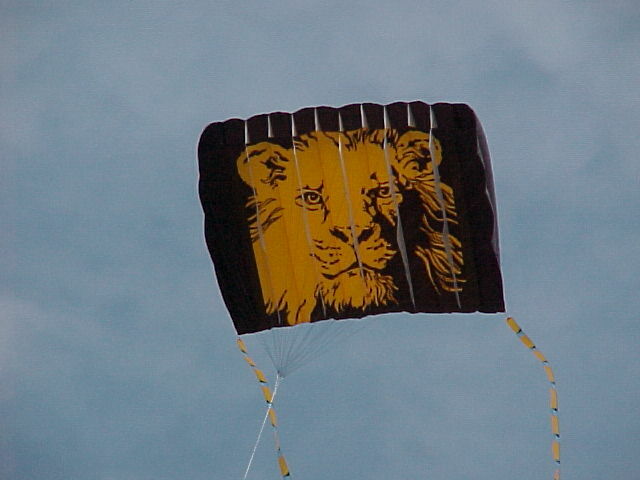 He flew a set of gorgeous Lion kites, as well as some fine Genkis. 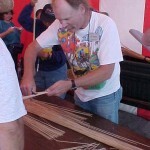 Stretch will be the featured instructor this year at the AOK Kitemaker Retreat in Rockaway Oregon, where he will be workshopping his famous parafoils. The festival was also pleased to welcome Rob Brasington of Tasmania, a surprise visitor. He flew his wonderful cellular kites and line laundry ‘langeliers’ Rob, who manufactures ‘Ground Zero’ dual line kites for a living, has just begun making and showing some astoundingly original and beautiful kites. – Monday opened with buggying demonstrations, a kite train workshop, kites and arches competition and ‘special friends’ events. – Tuesday was primarily a Clubs Day. It opened with the Pretty Kite Competition, followed by competing clubs madly hauling out kites all day in order to participate in the ‘Pun Fun’ flies, then culminated with a Rok battle. – Children’s and Seniors’ events took place on Wednesday. J.. Tolman and crew of volunteer assistants faciliatated the building of some 500 paper kids’ kites that flew beautifully…. Exhaustion from the previous day’s activities got the better of us and, except for a brief visit, we stayed off the field!!! – The Handcrafted Comprehensive Competition was held Thursday. This is the week’s ‘biggie’, as some of the finest kites found anywhere competed for the cherished blue ribbon. 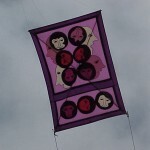 Since numbers were down this year, so was competition (83 competitors / 134 kites), but the quality was as high as ever. 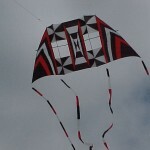 – Friday, the competition fields were devoted to dual line flying. The Junior dual control competition was held in Field A for the first time in WSIKF history. In addition there were stunt kite games and demos by some of the fine specialty and novelty fliers. Friday evening saw teddy bear drops, and as darkness fell, the lighted kite night fly and fireworks took place. – Saturday focused on Fighter kite competitions, a Cody kites event, the major Rokkaku Challenge, a Parade of Colours and recognition ceremony, with the banquet and auction taking place in the evening. There was more lighted kite flying and fireworks on Saturday night. Throughout the week, Corey Jensen directed the audience’s eyes toward a tiny orange speck in the sky, as Stormy Weathers tried to break the world record for highest altitude of a single kite. His 20 sq.ft.. star kite was met by an inversion layer at around 3000 ft., which interfered with the lift and foiled his attempts. I doubt that Stormy has given up, though. Another annual record breaker, Ray Bethell arrived later in the week, having just returned from Columbia where he had been touring for the second year. Ray was a bit under the weather, but was still to be seen daily flying his three kites simultaneously in his ‘spot’ on the beach. David Gomberg mesmerized the crowds for hours on end as he demonstrated a rainbow coloured set of ‘line poppers’ — which sail up the kite line, hit a stopper and collapse consecutively on each other like umbrellas, but with an audible “POP!” Very cool. Since numbers were important, any able body was recruited to fly for the teams. Imagine team captain Elain Genser’s surprise when a hastily recruited ex-Vancouverite turned out to be friend she hadn’t seen in 25 years who now lived in Tasmania. Bonus Points! The Americans, jingoistically determined to keep the flag in the U. S. of A., rallied, and managed to beat the combined team, but we accepted our defeat gracefully and settled for second. There were also many peripheral events such as the dinner parties on two consecutive nights hosted by the Washington Kitefliers Association (WKA) and Associated Oregon Kite fliers (AOK). These are the two clubs who sponsor this monumental event and provide the volunteer bodies to make it work. The auctions held at both these events help contribute to the funds for next year’s festival. It was also the time for the annual meeting and potluck of the Northwest Buggy Pilots Assoc. Friday evening also saw the annual cocktail party for World Kite Museum members. Saturday morning was set aside for the IRC #kites group breakfast……. The banquet and auction was a new experience for one KiteLife reporter. At the risk of sounding like Goldilocks (errr, Copperilocks)…The food was a wee bit overdone, the auction ran a bit overtime, but the Gomberg/Jensen team of auctioneers…. was j-u-s-t right!!! From David’s opening remarks to the sight of Corey running around the hall in his tailored kite-suit, waving a lovely silk scarf for all to see up close … they were a hoot! Hope the museum fund came away smiling, too! For those who survived all this, and were able to get up on Sunday morning, a final event was planned for 1:00 pm. 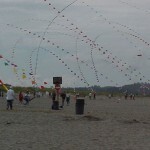 All were invited to participate in the mass ascension and an attempt to break the 1995 Western Hemisphere record for greatest number of kites in the air. Unfortunately, while the wind had been okay earlier in the morning, by the time it came to counting the kites in the sky, it had dropped, and it is doubtful that the record was broken. The arrangement of fields is always a challenge for the kite fliers. In the past few year the space for single fliers seems to have shrunk. With the addition of a field for fighters and enlargement of the flying field for the Internationals, there seems to be less and less reason to have a ‘preferred’ parking pass. These passes were initially issued to people who had large displays or kites so that they could operate fairly close to their vehicles. With less and less room to fly, the sky didn’t seem as full of single lines as it has been in years past. Will it ever be just right for everyone? Not in this kite time, me thinks. And the sand!!! 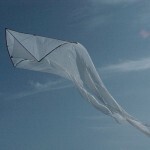 It seemed more shifty this year than last, making it much more difficult to slug through it with a load of kites. Bring fewer kites? No way! Both of us still smiling here in Canada …. All in all, another great WSIKF! Numbers will likely be higher next year because the AKA Convention and Dieppe will not factor into people’s festival related decision making, as much as it did this year. In any event, WSIKF can expect us back again next year. Hope to see you there … look for us near the KiteLife banner! WOW, UNBELEIVABLE !!! That is the best description of the WSIKF fighter kite events that I can think of. It was by far the best ever. If you missed it this year, be sure to mark your calendar RIGHT NOW for next year, and plan to BE THERE! You will have more fighter fun than you can imagine. So what did happen that was so waaaay cooool ? First of all, the setting was perfect! Beautiful Pacific Ocean in the background, warm sand on the beach, sunny blue skies sprinkled with mostly white clouds and a wind range of from 3 mph to about 9 mph. And best of all were fighter fans, all friendly, grinning, eager and excited about flying and learning. From the generosity of Jeff MacInnis, NFKA had a very nice covered tent area. A display of fighters was put up in the tent and we also used it for getting out of the sun, doing repairs etc. A great addition to the festival. Well, if you have a tent, you need a sign identifying the fighter area and our club, and did we have one! Dennis Crowley, with his brilliant creative style, created a “grabber” of an NFKA fighter sign. It was noticed and appreciated by everyone. Both Dennis Crowley and Gopal Das gave to NFKA kites they no longer fly and NFKA sold these kites to fighter fans for a donation to NFKA. Many thanks to both Dennis and Gopal. All during the festival Brian Johnsen, Ron Lowry and several others were very generous with their teaching skills. They had many folks trying fighters for the first time and flying quite well. This was a wonderful aspect of the festival and each new flyer brought grins to all of us watching the newbie get his/her feet wet with fighters. 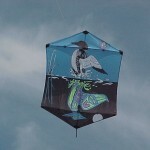 The festival started on Monday, and so did the fighter kiting fun. Practice combat battles and lots of flying and fighter kite discussions among fighter friends and newbies alike went on into the night, and right into Tuesday for a repeat of Monday. As Wednesday rolled around, more and more fighter kiters were arriving, making it more and more fun and very interesting. All of the flying was done with a backdrop of beautiful skies filled with the most beautiful kites on earth, a truly awesome scene. Wednesday was the day for Senior flyers. 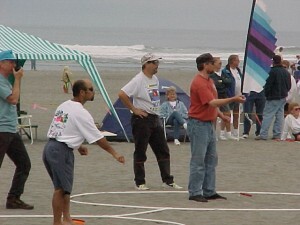 Chuck Lund was the festival director of the seniors fighter kite event, and did a masterful job. The event was not a combat, but a skills test, or obstacle course for the fighter kites, and, you had to be 50 or older to enter. Chuck had made a large hoop, a launching pad, pole with a cup to knock off and a pole with a balloon to pop! Toooo much fun and waaay difficult for us old guys! 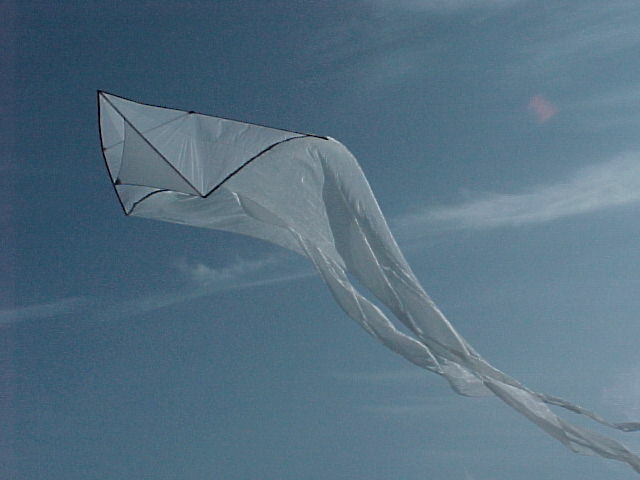 Chuck Lund of Tacoma, WA (north32st@aol.com) won 1st, using a kite made of Tyvek that he designed and built. 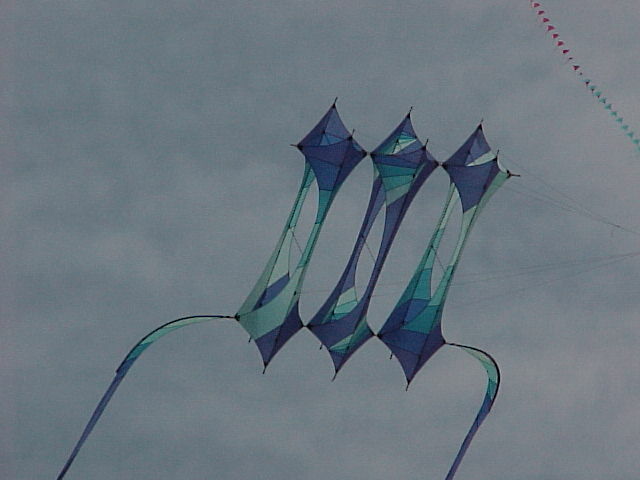 Howard Gordon of Palm Springs, CA (74672.740@compuserve.com) won 2nd, using a mylar Stafford Wallace Indian kite. 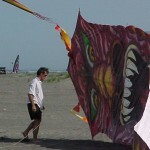 Bruce Lambert of Ocean Shores, WA (brucel@techline.com) won 3rd, using a kite made of mylar that he designed and built. Plus, every evening after the festival activities stopped, the fighter kite builders had to do what they like to do, build and design fighter kites. Fighter kite designing and building was going on and kite flying and kite building discussions continued til about 2 am. 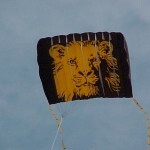 So if there was ever an opportunity to live and breathe fighter kites, it was this year at WSIKF! Gina, Michelle and Johnny Hsiung opened up their place each evening for all fighter fans to congregate, eat fantastic food, enjoy the friendship of fellow flyers, and to build kites! What gracious, generous people they are. Thursday was the Footlong Hotdog fighter competition that was dreamed up and directed by Chuck Lund. 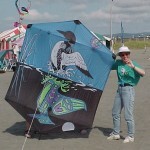 It was sponsored by Chuck and the Northwest Fighter Kite Association and was a competition using small kites, the kite’s spine had to be 12″ or shorter. The battles were a gas to watch, fast darting small kites, doing ariel karate like masters. Johnny Hsiung of Los Angeles, CA (gina.hsiung@email.csun.edu) was the winner. 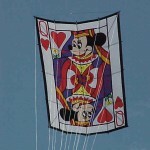 The kite Johnny used for his victory was made from Orcon and was designed and built for Johnny by kite maker extrodinaire, Jeff MacInnis of Portland, OR. And since part of the NFKA’s culture is fun and humor, Chuck made sure the winners trophy was in keeping with the club’s spirit. It was a plastic hotdog, complete with catsup and mustard. It was attached to a red, white and blue ribbon to be worn around the winner’s neck, like an Olympic Medal. Johnny wore it proudly. Thursday was also the day of Handcrafted Kite competition. 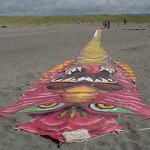 Jeff MacInnis of Portland, OR (alondrakites@hotmail.com) entered 2 fighters in the handcrafted competition. A beautifully crafted kite made of Orcon is an ultralight high performance fighter Jeff calls the “Silhouette”, and a bamboo and silk fighter upon which Jeff exquisitely hand painted a beautiful lotus flower. Each was entered in a separate category, and Jeff won two 1st place ribbons! 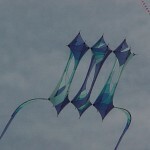 Each kite took 1st in its category. Congratulations Jeff!! Friday was the day of the NFKA Ken Conrad Buka Cup Challenge. This was an event created by Dennis Crowley (astonecrow@seanet.com) , a Buka superfan. Dennis titled the competition in honor of Ken Conrad, the person who introduced many of us to the Buka Fighter kite. 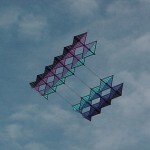 The buka is a rectangular kite and one of the long edges is the leading edge. It is sort of strange to watch fly, but is very agile, and precise. A blast to fly. 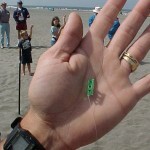 Bruce Lambert of Ocean Shores, WA won the Buka Challenge, using a Buka made of Mylar that he built. The trophy was a beautiful rosewood shadow box frame surrounding and highlighting a miniature Japanese painted paper buka kite and sitting next to it, a crumpled cup! This trophy was a masterful and creative work of art made by Dennis Crowley. Saturday was the day for the “official” WSIKF fighter kite competition. The day we were all waiting for! Richard Hurd (rhurd@olynet.com) was the Fighter Kite Event Director for the Festival and he did a super job planning, organizing and dealing with all of the variables that are bound to arise in any competition where there are 32 competitors. That’s right, 32 competitors! A double elimination format was used, so each flyer got two chances to win. It was the best competition I have every witnessed, and most of the flyers said the same thing. Thanks Richard, for such a fantastic competition. Each of the battles were hard fought with lots of creative flying being shown, and tons of skill. I was surprised at the high skill level of all of the flyers. This was a very competitive field of fighter flyers! It was fighter kite flyer’s heaven! Sooo many BIG GRINS and too many giggles to count. 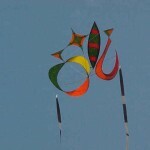 It was certainly the fighter kite event of the decade. One battle in particular between Johnny Hsiung of Los Angeles, CA and Jeff MacInnis of Portland, OR was a battle none of us will ever forget. Each of the flyers were flying beyond their best and pushing the skill envelope beyond were anyone would have guessed it could have been pushed. The battle was long, and extremely close all the way. The audience, probably 200 people or so, was gasping and shouting with each close encounter and with each attack and with each breathtaking escape! It was SUPER EXCITING!! These flyers were providing the best example of what short line fighter kite competition flying can be like. It is impossible for me to explain it in a way that will allow you to really feel the excitement created by the expert flying of these two master flyers. In this particular battle, Jeff finally won. Immediately afterward, both Johnny and Jeff went to each other and gave each other a big hug and congratulated each other on their fabulous flying. The audience gave a huge cheer and loud applause for the incredible show! 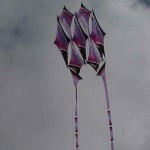 Johnny Hsiung of Los Angeles, CA won 1st, using a kite made of Mylar he designed and built. 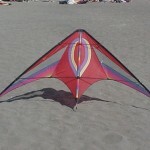 Bruce Lambert of Ocean Shores, WA won 3rd, using a kite made from Orcon he designed and built. By the way, if you would like to have your own “Silhouette”, Jeff MacInnis does sell them. I think they are around $50 each. 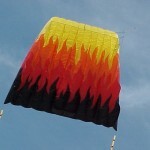 You can reach him at alondrakites@hotmail.com. Ric Merry along with Gina Hsiung were taking lots of pictures of all the various events, and hope that some will be on NFKA website http://www.eskimo.com/~johnsen/nfka/index.html or the Cyberfighter website http://www.csun.edu/~hfoao033/fighters.html So check the sites often in the next couple of weeks to see the latest photos. I am certain many important things occurred that I did not recall when writing this update, so if you have some additional info to share, please do. And if I left out people who should have been recognized, please let me know, or better yet, just “do it” let all of us know! NFKA is all of us, so “speak up”! Please share your perspective of WSIKF. This entry was posted in 1998, Issue 5 (Sep/Oct), KL Archive and tagged competition, festival, fighter.